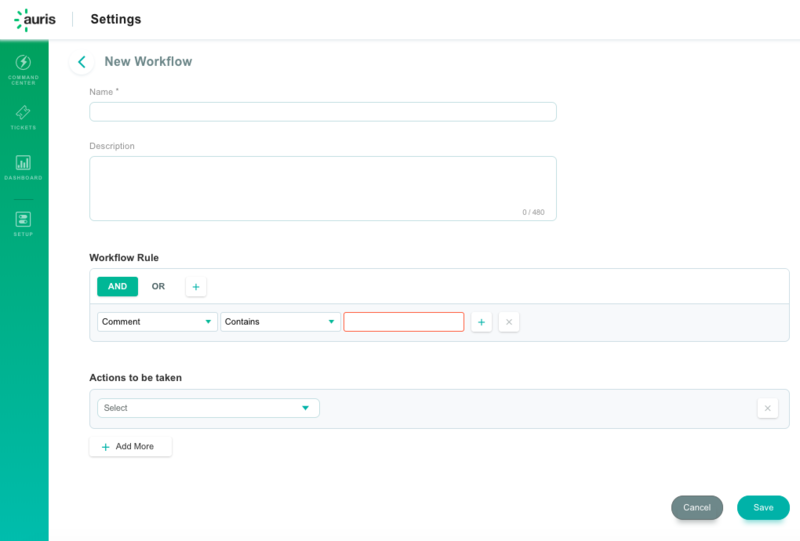 Workflows: An amazing feature is now live on Auris! The premise of the Auris platform has been to enable action using the insights gained, in real time. Some of these actions can be tactical – requiring an immediate alert. Workflows enable this by automating rule based actions. You’ve seen workflows before, so what is unique? These workflows are more potent that the usual, because they act on enriched data. For example, a workflow can act to alert the sales team to call up a consumer showing a “buying intent”, something our AI-powered models identify in real time. Or else you can get alerted if an influential person or handle has commented about something which of interest to you. The conventional workflows can at best set an auto-reply. Enriched data also allows for multiple people within the organization to be involved. For example, city or region based teams can get access to real time feed to any mention related to their center, city or region. Let us say supply chain issues related to a product in their region. Now imagine the utility – multiple teams within your organization receiving important alerts where the action is within their sphere of influence. This can be transformational and improve the organization’s responsiveness overall. How do Auris workflows help? When an influencer says something negative? Get alerted and set up an auto escalation rule. For example, if an influencer says something negative you’d want someone senior in the organization to see that rather than wait for the natural course of escalation to happen. That is now made possible by Auris workflows. Auto-push to CRM: Someone looking to buy your product or service. Workflows can now be set to push these automatically to your CRM. Immediate ROI for you! Well, we also have auto-replies: You are away or you wish to send auto replies to certain types of queries. Get our bots to reply while you are away. How to setup workflows on Auris? Setting up Workflows is very simple. Go to Settings in the top right (next to your Login picture) and click on Workflows. Start by the clicking on the ‘Create a Workflow’ button. You’d then see the following – you can now define your rules and the corresponding action(s). First, define all those insight-led-alerts which you need in real time. For example, a competitor launching a new product is something you’d like to know about immediately. Or an influencer complaining about your service. Second, identify the teams who would be best equipped to address each one of these alerts. Enroll them in the alerts. Involve the sales team to see what kind of “leads” or “prospects” they’d wish to be alerted about. Conduct a simple training on the process of handling these alerts. This should set your team and others in the organization to make the best use of Auris workflows.